Comments: Launched by Marvel UK on 11th September 1980, Marvel Team-Up included an eclectic mix of reprinted US series; one of Marvel UK's ongoing problems was that while Marvel US had a wide back catalogue of series, there were relatively few outright headliners, and once they were used in a couple of comics, it became a challenge to pick a mix of stories that could make up an ongoing title. For Marvel Team-Up the two headliner strips were the US Marvel Team-Up (and thus, through it, Spider-Man, the only character to sustain his own long-running UK title) and Fantastic Four, backed up by What If?, Ms. Marvel, Morbius the Living Vampire (from Adventure into Fear), Jack of Hearts (reprinting Marvel Premiere #44; other short run characters from Marvel Premiere and later Marvel Spotlight would replace him once that issue was fully reprinted), and Earth 331/3, an original, three panel humour strip by Tim Quinn and Dicky Howett. With this wide variety of characters, with the Marvel Premiere, What If? and Marvel Team-Up reprints in particular enabling a wider-than-normal range of characters who could be put on the cover, the comic promoted itself as "More Superheroes Than Ever Before!" 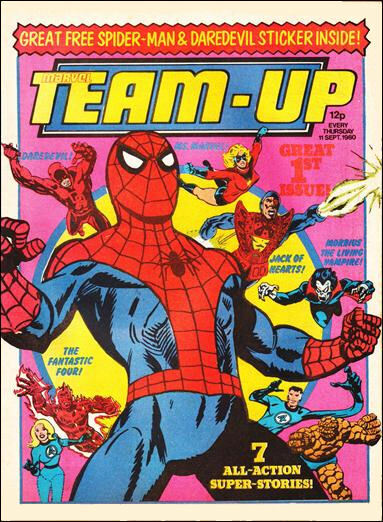 However, despite this and the star power of Spider-Man, Marvel Team-Up couldn't sustain sales, and the axe fell after only 25 issues, on 4th March 1981. A week later it merged into Spider-Man and Hulk Weekly #418.